NEXUS is counting down the days to their May 9 and May 11 performances with the Rochester Philharmonic of Takemitsu’s extraordinary 1990 concerto, “From me flows what you call time…”. The performances and pre-concert chats will take place in the beautiful Eastman Theatre in Rochester. The Theatre celebrated its 90th birthday last year and has been Rochester’s preeminent performance space since its opening in 1922, a year after the opening of the Eastman School of Music. NEXUS will be in good company. 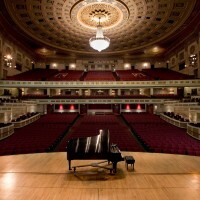 The Eastman’s wonderful stage has welcomed such musical luminaries as Bob Brookmeyer, Stan Getz, Keith Jarrett, Dave Brubeck, Renée Fleming, Paul Robeson, Yehudi Menuhin, Leonard Slatkin, Sir Georg Solti, composer John Williams, Stravinsky and Penderecki – just a few of the famous names that have graced the Eastman Theater. The Theatre, as you can see, is magnificent. George Eastman built it as a center for music, dance, and the silent films of the day that could be shown there with orchestral and organ accompaniment. 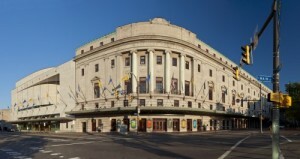 Today, in addition to being the principal hall for the Rochester Philharmonic Orchestra, it is also the primary concert hall for the Eastman School’s orchestras, wind ensembles, jazz ensembles, chorale, and The Eastman Opera Theatre. 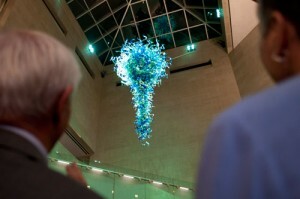 It is large enough to present fully staged operatic productions each spring. 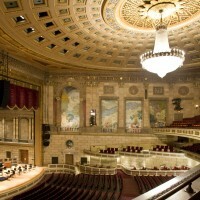 NEXUS is looking forward to being once again on the Kodak Hall, Eastman Theatre stage.